Jeff Owens:The Real Deal.....: What does it mean to wear the G…..? What does it mean to wear the G…..? 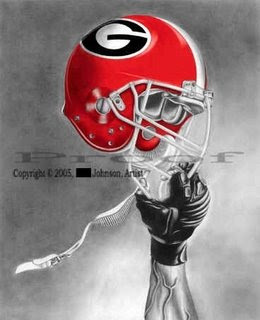 I ask myself this question every once in a while- what does it means to wear the G. It is a privilege to suit up on Saturdays and run out of the tunnel at Sanford Stadium amid yells from over 92,000 citizens of Bulldawg Nation. Every time I step on the field, I can feel the all the emotion coursing through my body. This is what all of those years of playing in the backyard and all of those hours of practice are for. For sixty minutes on Saturday afternoons in the Fall, Sanford Stadium is a field of dreams. Countless boys, young and old, have dreamt of wearing the oval “G” and representing what being a Bulldawg is all about. I and my teammates get that opportunity every time we put on the “G”. The first time I heard the phrase “playing for the G”, I was in freshman orientation for the signing class of 2005. We sat in a room for seven hours going over what would be expected of us as freshmen student-athletes. Chester Adams, one of the upper classmen, spoke about wearing the “G”. At first I did not understand what it meant; I did not know that I was not just playing for myself but for all the men that have ever worn the “G”. I tell the guys everyday that what we do here reflects on the whole program. Georgia football is bigger than any one player on the team. I asked some of my teams this same question, “what does it mean to wear the ‘G’?” Rod Battle said “playing for the ‘G’ is like competing for the United States in the Olympics. It’s my home state, a place where I’ll be forever connected to. Plus I have all the extended family members I have grown to love here”. Since I am not from Georgia wearing the “G” has a different meaning to me. Playing for Georgia has changed my life in so many different ways; I have grown spiritually, mentally and physically. I have grown spiritually by finding Christ as my Lord and Savor, our team Chaplin, Thomas Settles, has been like a big brother to me. I have grown mentally at Georgia because of the high priority on educational excellence. I have grown physically at Georgia by getting bigger, faster, and stronger. When I step on the field next season I will play every game like it is my last. This is what it means to me to wear the “G”. Everybody that has played football at the University of Georgia has a special memory about wearing the “G”. I can remember my first time running onto the field as a Georgia Bulldog. It was in 2005 against Boise State; I did not know what to expect. My heart felt like it was beating five hundred miles per second; on the first play from scrimmage Tony Taylor caught an interception and the crowd went crazy. I also remember my first time getting into that game. I was so nervous I could not even concentrate on the play call. By the end of the game, however, I made three tackles in my first collegiate game. I look back from 2005 and see where I am today. I was only a pup then and I did not know that with great privilege comes great responsibility. Now that I’m a full grown Bulldog, I know that wearing the “G” on Saturdays speaks volumes. I not only wear it for myself but for all the legends that have come before me, like the Hines Wards’, Thomas Davis’, Greg Blues’ and the countless other men who have carried on our great tradition. I wear the “G” in honor of the history that has been made in Athens and the history that has yet to be created. It is an honor and I am very thankful to have an opportunity to play for the University of Georgia. Well said, Jeff. You are a great Dawg. That interception by Tony Taylor to start the '05 season was one of the rowdiest I remember Sanford Stadium. Of course, Odell's long TD against Auburn and the entire Blackout '07 were also big time electricity. Get well soon so we can have you representing the G again on the field next year! Woof! Bless your big ole bulldog heart, you are such a DGD. I've been lucky enough to meet you on a couple of occasions and your parents at the gala. Ya'll are such nice people and you have such a great attitude and sense of humor. I hope that you get well soon and that your dreams/wishes come true this season! I'm proud to be a fan and graduate of a University that has athletes like you Jeff. What a great way to see why you are a part of the "G." Good luck in bringing up the new group of pups this year. I look forward to seeing this TEAM on the field in the fall. WOOF WOOF WOOF! Damn Good Dawg! And we're thankful you came here. Thanks Jeff. Great write up Jeff! I pray for your recovery to be fast, and that you can join the Dawgs on the fields once again! 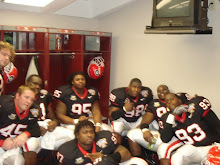 lets see that junkyard dawg defense again in 2009 and make more history of the G!!! From Georgia fans everywhere, we are proud to have someone like you on our team. Everyone can see how you play the game with passion and love what you do. I can't wait to see you next year dragging people down in the backfield. Great post, Jeff - look forward to cheering you on all next year. Go Dawgs! Now that's a post right there! Like always, can't wait for fall to roll around again and see the red and black out there on the field. No place on earth I would rather be. Hey Jeff, thanks for coming to UGA. You're one of my favorite dawgs of all-time. I wish you nothing but the best next season as well as in the NFL. Just remember when that time comes to be the NFL, you will have the dawg nation behind you 100%. God bless. You are a damn good dawg. I'm so glad we get to see you one more season in the R&B. Good luck, great writing, and go dawgs! Of coarse I don't know what the outcome of the '09 season is goint to be, but I have a feeling that it's going to be special for you & the rest of the Bulldawg nation. Good luck & God bless. Thanks for coming to play for the University of Georgia. I hope you continue to update this blog as I, and I am sure others, would love to hear what you have to say. This was a great post and we all wish you the best in the upcoming year. I'm proud to have men on the team like yourself. I can't wait for football season now! Thanks for staying another year Jeff! It is the people and players like you who make us all so proud to say that we're a part of the Bulldog Nation! Look forward to seeing you on the field again!!! From a man who used to teach writing at UGA, let me tell you that you are a fantastically well-worded young man. You might want to consider stopping into the Grady School this Spring. All of us in Bulldog Nation are pulling for you throughout your rehabilitation process. You are someone we can truly be proud of. Thanks for your effort, Jeff, and GO DAWGS!!! Jeff: I only ever played high school football and wasn't good enough to even be a starter there. But, as a little boy, I grew up dreaming of wearing the "G" and playing between the hedges. I'm an old fat man now, but it makes me VERY proud to know that my dream and desire lives on in players like you. You get it. You understand the pride that all of us fans feel in "our" guys and "our" team. You're a Damn Good Dawg, son. Keep representin' and all best for all YOUR dreams for the 2009 season. You're a damn good Dawg man. I can only hope more of our players begin to think like you. Good luck in 2009. I'll be watching from the stands. Very well said, Jeff. I love Georgia football all the way down to my soul, love everything about it. Everytime I see my boys run out onto the field with their silver britches and red helmets, my heart just swells with pride. Yes, y'all wear the G for all the great ones before you, but don't forget you wear it for us too...the thousands and thousands of people across the country who bleed red and black, who greet others by barking, and who know that every conversation can be made better with one simple GO DAWGS! God bless, Jeff, and I can't wait to see you play again this fall. We are honored to have you representing our school on the field, wearing the "G."
You are a great DAWG and can't wait to see you back on the field next year. The fact that you have grown in Christ is really all that matters Jeff. Just have fun playing football while you wear that "G". Hope your rehab is going well and God Bless! Wow....I'm a lifelong Dawg fan, alumnus, and season ticket holder. That was a very special post. I had often wondered, when we sign players from out of state, if they feel the same connection as Georgia born players do. I will never doubt that again. Thanks for bloggin'. I'll check back often. You are definitely the real deal. Sic 'em, Jeff; 211 days 'til the hoedown in Stillwater. Make sure those okies never forget what the "G" is all about. Do watch out for that dadgumm field-turf they got out there, though. Well said Jeff!! Hope you get better and REPRESENT the "G" in bringing a NATIONAL CHAMPIONSHIP back to Athens this season! Speaking as one of the 92,000+ dawgs in the stands, you guys mean the WORLD to us!! I can't begin to tell you how proud Bulldog nation is to see men like you wearing the 'G' & representing our school and our football program. You're a damn good Dawg! I never had the honor of wearing the 'G' on my helmet, but hearing how much it means to you means to you is awesome. I hope that all of the seniors will make sure that the underclassmen feel the same way. Jeff, You're doing what (most) everyone who reads your blog wishes they could do; suit up and run out of the tunnel on gameday. You're a gifted athlete, a gifted person, and a gifted writer. Please get well soon and enjoy your senior year at UGA. PS. Do us all a favor and sack Tebow 8 times in Jacksonville. We all know you can do it. The chills are still running down my spine. I've read countless books about UGA football from coaches, players, journalists, etc. This might be the best piece of writing over the dawgs I've ever read. Thanks for sharing this with us. You are an inspiration to all your fans. Good luck and thanks for wearing that "G."
And we're honored and thankful to cheer for great young men like you. GATA in Stillwater! Can't wait! A post like this reminds me that I love the Dawgs not just because UGA is my alma mater, but because we have young men like you carrying years of tradition and greatness into battle for the Bulldawg Nation. Thank you for representing all that makes college football amazing! GO DAWGS! Can't wait to see you between the hedges later this year! As another non-Georgian and alumnus of the Redcoat Band, all I can say is, "HECK YEA!" We'll be cheering for you and the rest of the Big G Wrecking Crew this (and every) season! Fantastic post - you're a gifted writer. This is a great site, especially for a Georgia alum ('99) like me. I've ended up down in Australia and rely heavily on the internet - blogs, podcasts, streams of the games - to stay in touch and it's great to read the thoughts of a player directly. Looking forward to seeing you on the field this Autumn. P.S. I'm a Floridian refugee as well - glad you made it up to Athens! Jeff, bring the defensive line to our house when you're in Nashville for the Vandy game & we'll grill out. I love it Jeff! IT's GREAT TO BE A GEORGIA BULLDOG!! You are a DGD! I look forward to seeing you dominate the line of scrimmage again!! The DAWG Nation loves ya' Jeff! We all wish you a complete and speedy recovery and look forward to seeing you GATA this fall! I get chills just reading what wearing the 'G' means to you. It's players like you who have built the tradition and excellence that is The University of Georgia Bulldog football team. Good luck training for the upcoming season and even when your time here in Athens comes to an end remember, once a dawg always a dawg. Your in the family forever. God bless. God Bless you Jeff, Every time you take the feild, My heart swells with pride, it makes me proud to be a Dawg, proud of our tradition, proud of our fans, and proud that you are without a doubt, the leader of our team. You do the G proud, God bless, and I look forward to seeing you on the feild this season. Hunker down and finish the drill. Very well written and inspiring! I am glad to have the privilege of watching you every Saturday. Jeff it is so refreshing to read your blog. YOU GET IT!!! I am so glad you are on our team. I am so sorry you were injured this past season. But I couldn't be happier that you are back! It is awesome that you are here to help the younger bulldogs mature!!! It makes me happy to see how you have grown mentally and physically. I wish you all the luck in the world!!! You really do deserve it!!!!!!!!!!!!!! You are a great bulldog, and even better person. You make this alum proud that you wear the G. Thank you for coming back. I will pray blessings on you this season and in your life ahead. That was the most inspiring message I have read in a long time. The measure of a man is decided when he has fully looked within himself and his surrondings to understand their true purpose. It seems to me, that you fully inderstand and appreciate the moment that you are in. (Others before have not been as lucky and wish they could have years/games/snaps back) To understand what it is worth to you and others, should allow you to keep your tank full with premium octane when it comes time to bust heads next year. You are a model bulldog and the message you speak should echo infinitely in the town of Athens, GA. God Bless You Jeff and God Bless The Georgia Bulldogs. Thanks for your leadership and commitment. Its players and people like you that make us proud to cheer for "UGA" each and every fall Saturday. Keep up the hard work and god bless you. Come this fall I know you will be ready to hit someone else. Go Dawgs!! Jeff, you are certainly a DGD! I got goose bumps reading this. I can't wait to see the Dawgs shock the world next season! Thanks for playing your heart out and believing in the G! GOOOO DAWGS! Thank you for writing that. You are a truly inspiring young man and we are proud that you wear the "G". God bless you this year and in the future. GO DAWGS!!! Well said! I hope you share your message with all the new Dawgs. All football Dawgs, no matter what career they pursue after college, can always return to UGA and see the continuation of their legacy. For the rest of your life, more people than you'll ever know will be recalling and celebrating your gridiron victories. WHOOOOOO!!!!! It's great, to be, a Georgia Bulldog, said it's great to be a Georgia Bulldog! I look forward to seeing you play this year. We missed you sooo much! Thank you for having this blog. I love it! Jeff, It's players like you who make the "G" mean so much. Good luck and god bless you all. Thanks for all the hard work. SICKEM!!! Jeff, It's players like you who make the "G" what it is. We "BULLDAWG NATION" are proud to wear the red and black every Saturday, and days in between thanks to the hard work you guys put forth all year. Thanks and god bless you all. SICKEM!!! Holy Cow Jeff! If your doing all of this with no help then you haven't yet realized how well you are dong at it. Your success as a player will only help get you noticed, but this is good work. Jeff, thanks. I get chill bumps before the game. I have to wear glasses to hide my watery eyes when you guys come out on the hallowed field at Sanford Stadium. I come early and stay late win or lose. I sat in the heat last summer with my kids and my Bulldog puppy watching you lead fifty boys and girls with wide eyes and huge grins in a touch football contest. You will excell my friend. You will succeed in life. God has a plan. Love ya bro. Good luck. All I can say is Wow! I only "know" you by watching you the last few years and knowing you are a VERY talented young man. I have heard you are a leader. When you went down, I yhink your leadership was missed. 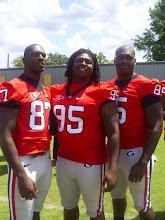 I feel your coming back ro UGA for your senior year is GREAT for the team and you in 2009. But, more inportantly, regardless of what kind of pro career you have, I have a feeling that you will be one of the DAWGS that is spoke of and reveared for many years in the furure. After reading your Blog, I know you are a special person, and I am so thankful that you chose the University of Georgia from Sunshine Florida. I felt last year that you were one of the most important members of that team from a talent stand point. You have confirmed that. After reading this, I think your importance and influence goes beyond talent. Mr. Owens, you make me very proud to be a supporter and fan of UGA. I think you are one of the "special" people in life, that get "IT". I will be pulling for you more than ever. All I can say is WOW, I am certain your family is very proud of you and I know the BULLDOG NATION is proud and thankfull for you and the decision you made to bless us. You are special. ...and THAT is what it means to be a Georgia Bulldog! God has blessed us, every one. Jeff, thank you for writing this, its great to see a player's feelings toward his team. I can't wait for fall for some reason this team seems different than last year's. Players like you, Geno, and Rashad who stuck around really mean alot to us dawg faithful. Thanks again Jeff and Go Dawgs!!!! Damn good Dawg Jeff! God Bless you in all that you do.